Render of a Peahat from Ocarina of Time. Peahats (ピーハット, Peahat) are enemies from The Legend of Zelda series. Peahats have appeared in many games in the Legend of Zelda series, starting with the original game for the NES. In the early games, they were invulnerable unless if they are resting. Some incarnations later on can be struck while it flies: the Ocarina of Time/Majora's Mask incarnation, which appears in Smash Run, can be struck at its roots, while the Wind Waker incarnation can be struck with projectiles. 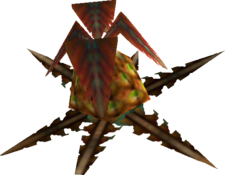 Peahats in Twilight Princess and Skyward Sword serve as Clawshot targets instead of acting as enemies. The larvae appeared in Ocarina of Time and Majora's Mask. Like in Smash Run they are spawned by Peahats, usually at nighttime. They would attack Link and could give chase. Peahats appear as enemies. They float around and attack by ramming into players while quickly spinning. They can also release smaller larval Peahats which can be quickly defeated. These floating plants have been part of the Legend of Zelda series since it began. If they detect you, they'll spawn Peahat Larvae to chase you down. They'll also spin rapidly if you get too close, cutting you like a kinfe. Yep, they're powerful foes indeed, but the rewards for taking them down are great. This page was last edited on November 13, 2018, at 19:33.